The Mustang Success Center provides advising-related training for undergraduate faculty advisors, primary-role academic advisors, and peer advisors throughout the Cal Poly community. The advisor training curriculum is guided by NACADA’s core competencies of advising: Conceptual, Informational, and Relational. This comprehensive advisor training program is designed for primary-role academic advisors and includes initial training and ongoing support through the first year of advising. For additional information about any of the programs listed below, please contact Christina Wolfe-Chandler in the Mustang Success Center at crwolfe@calpoly.edu or 756-5735. Academic Advisor Training is a two-week course designed to provide a standardized training experience for new Cal Poly staff members who serve in an undergraduate student-advising capacity. We cover conceptual, informational, relational, technological, and personal components of advising. When: Level 1 training is available upon hire; supervisors should contact Christina Wolfe-Chandler to schedule training for their new advisor. The level 2 training program is a series of cohort-based workshops where we explore various advising theories and approaches through group discussions, case studies, and engaging activities. When: Level 2 training is offered each academic year, with one or two workshops per quarter. Email invitations are typically sent out in August. This professional mentoring program provides new advisors with structured one-to-one professional partnerships with experienced advisors to offer career guidance, support, and a different perspective. When: Mentor Orientation and the program Kick-Off event occur at the end of fall quarter. One-on-one mentoring meetings are scheduled monthly, January through May. A program Wrap-Up event occurs in June. Email invitations are typically sent out during Week 3 of fall quarter. The three-part faculty advisor training series introduces advising core competencies to Cal Poly faculty members who serve in an undergraduate student-advising capacity. Are you new to faculty advising at Cal Poly and would like some information and support? Have you been advising for a while, and want a refresher? The "Nuts and Bolts of Faculty Advising" workshop provides an overview of university policies, curriculum advising tools, the registration process, and the advising structure at Cal Poly. Now that you’ve got the nuts and bolts basics, it’s time to stock your advising toolkit. 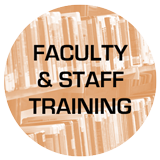 Effective advising is more than just checking off boxes; the “Assemble Your Faculty Advising Toolkit” workshop provides an introduction to the impact of advising on student retention and graduation, developmental advising pedagogy, and various campus resources. Prior completion of FA 101 is recommended. It’s time to put your advising toolkit to use. In the “Building Student Success through Faculty Advising” workshop, faculty advisors collaborate on complex case studies to address student challenges; this training also lays the foundation for applying student development theory to advising. Prior completion of FA 102 is strongly recommended. Peer Advisor training introduces Peer Advisors to campus-wide policies, tools and concepts. This two-part program begins when the Peer Advisors are newly hired and continues with an annual Professional Development event for continued engagement within their Peer Advisor community. For additional information about any of the programs listed below, please contact Christina Wolfe- Chandler in the Mustang Success Center at crwolfe@calpoly.edu or 756-5735. The Campus-Wide Peer Advisor Kick-off is an introductory training for Peer Advisors at Cal Poly offered during Spring Quarter. It connects newly hired Peer Advisors from different colleges on campus in order to provide a collective introduction to the conceptual, information and relational components of Peer Advising. Students engage in case studies and lively discussion with campus partners in order to introduce them to Peer Advising at Cal Poly. Each year Peer Advisors from across campus come together to engage in discussion and activities around a selected advising topic. This event guides students as they delve into the conceptual component of advising and begin to connect their day-to-day interactions with broader theories and practices within advising. Students are encouraged to attend each year as the topic will be different.